Get a Kick Out of Tomorrow! A history and examination of martial arts in the 21st century, as self-defense, sport, art, and virtual-reality activities. Find out what's going on in "modern day" Transhuman Space as well as the recent "past." 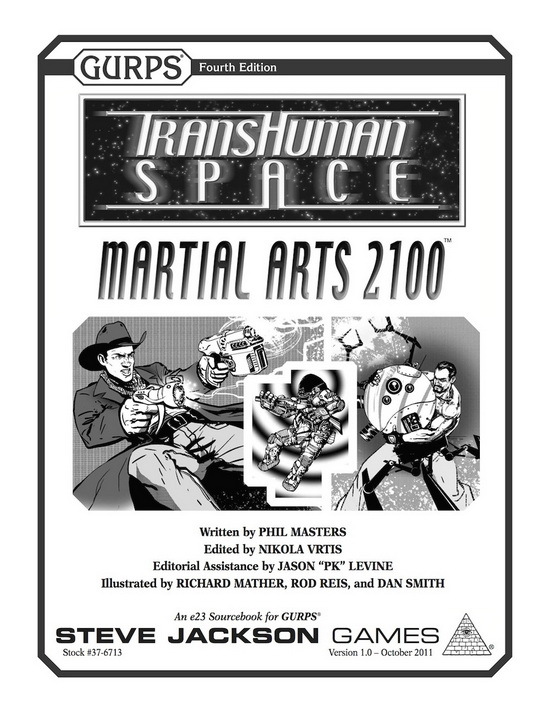 Rules and guidelines for using GURPS Martial Arts with Transhuman Space – including new techniques and rules for nonhuman physiology! Over a dozen new styles, plus three styles derived from tomorrow's hit media! Information on cutting-edge weapons, shields, and armor. A look at the synapse-shaping software of the future. Get with the program! The urge to brawl is hardwired into our bodies; why fight the system? 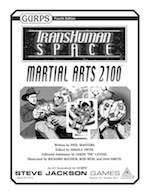 With Transhuman Space: Martial Arts 2100, you'll fight the future with style! For the tools and tips you need to run a Transhuman Space campaign in GURPS Fourth Edition, pick up a copy of Transhuman Space: Changing Times. With GURPS Martial Arts, you'll have the rules you need to customize the GURPS hand-to-hand combat system. For futuristic gear of the near-now and far future, check out GURPS Ultra-Tech.